You guyssssss…I know so annoying but I’m so excited because this recipe took me a ridiculous number of tries to get right. And when I did, I kind of freaked out. So did my friend, Nina. 🙂 I had to share them with her otherwise I would eat them all. 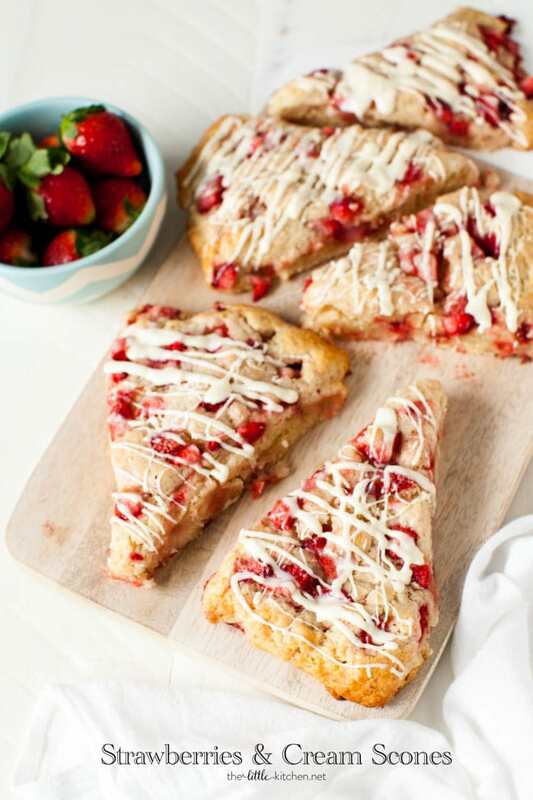 It’s strawberry season here in Florida! Last year, I went on a farm tour and learned all about strawberries! 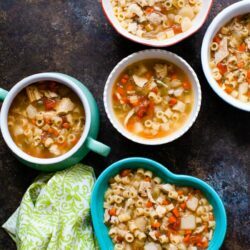 The season ends in March so I had to get moving and get this recipe right. 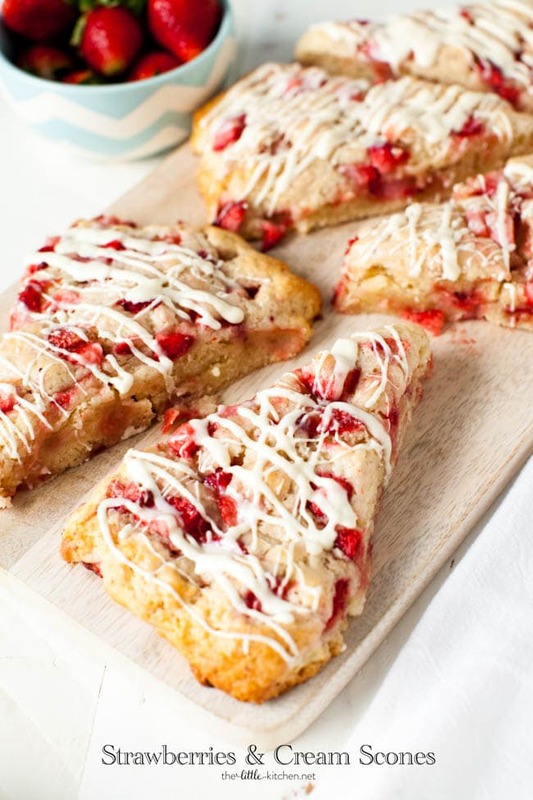 I added a white chocolate glaze to these strawberry scones but they are totally optional. I just love white chocolate so much, I couldn’t resist! 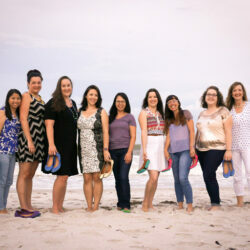 Oh I wanted to mention that I recently updated my About page and created a Welcome page for those new to the site. 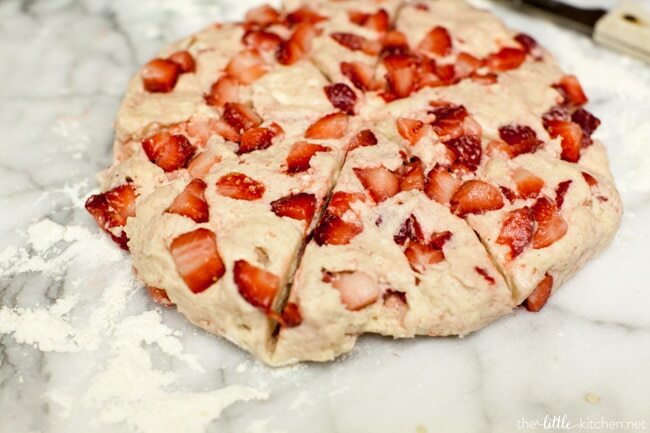 First, cut up the strawberries and freeze them for at least 30 minutes. This step is crucial. They need to be frozen solid before baking so they don’t turn to mush when baking. When you cube up your butter, stick it back in the fridge. It needs to be cold for this next part. 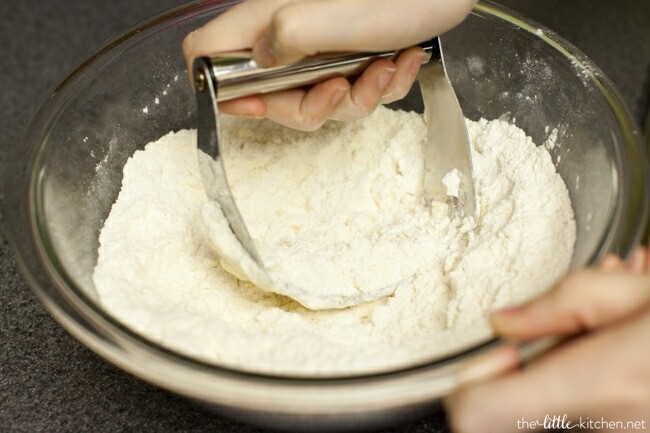 Cut the butter into the flour and sugar mixture. Can you see the butter? It’s a beautiful thing. 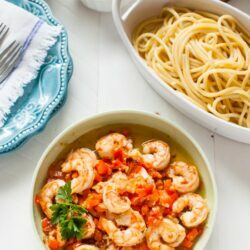 Once I added a little lemon juice to this recipe, it made it even better. 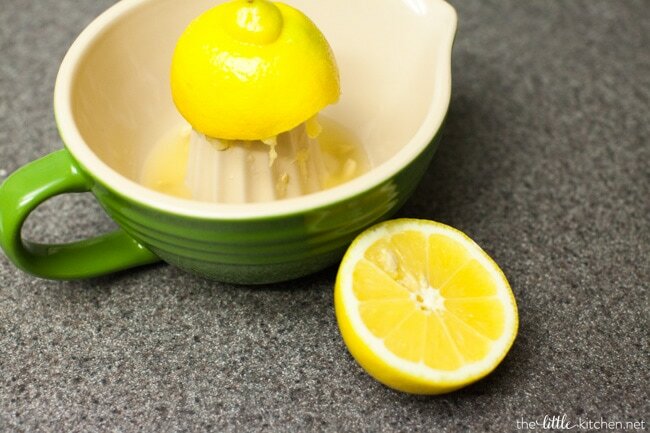 Mix the vanilla extract and lemon juice in with the heavy cream. That way you know all of these ingredients will be thoroughly mixed into the dough. Mix the heavy cream in with a fork. There the dough is starting to form. I mix the strawberries in, in two batches to make sure that there are strawberries in every bite! Use your hands to mix it in. I molded the dough into a circle. Cut in half with a knife and then cut in half again. Then cut each quarter in half again to make eight wedges. I put them on my baking sheet about 1/4 to 1/2 inch apart. Then, brush the tops and all of the sides with heavy cream. I love how they look slathered in cream! Bake them for 27 to 28 minutes at 400 degrees F. Allow them to cool and then drizzle the white chocolate on top. It’s truly a beautiful thing! 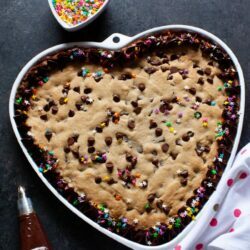 I’m going to be making these again soon! 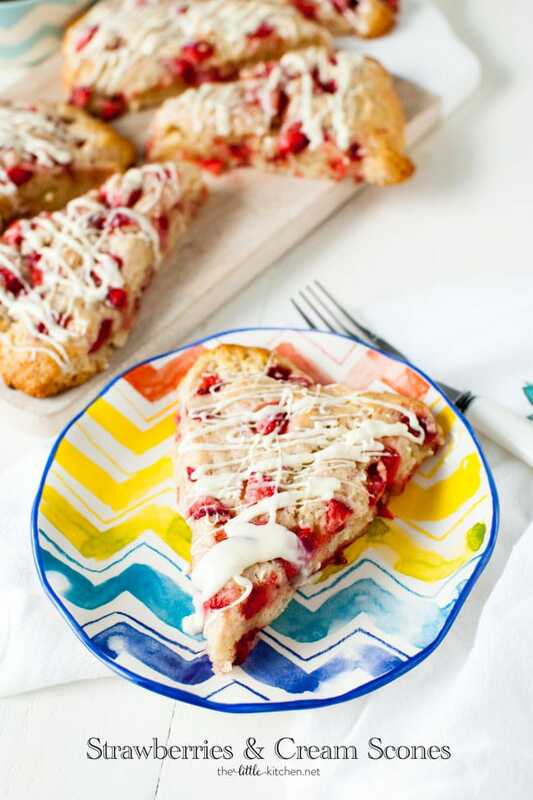 Take advantage of the Florida strawberry season and make these soon! I know you’ll thank me! 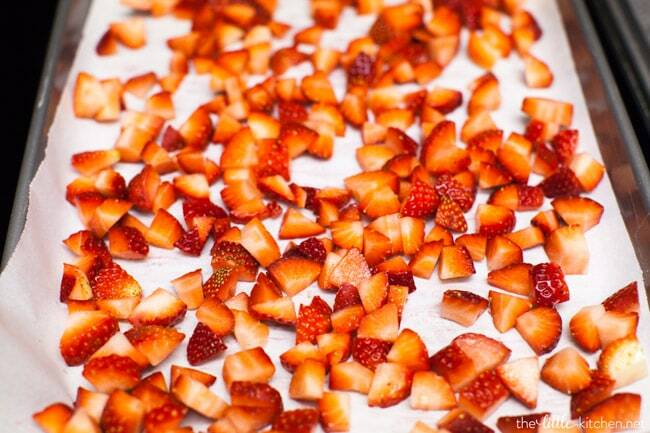 Prep and freeze strawberries for at least 30 minutes in one layer on a baking sheet covered with parchment paper. 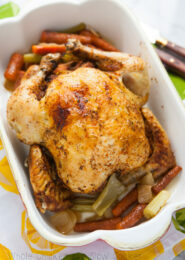 Heat oven to 400 degrees F. Cover a baking sheet with a silicon baking mat or parchment paper. 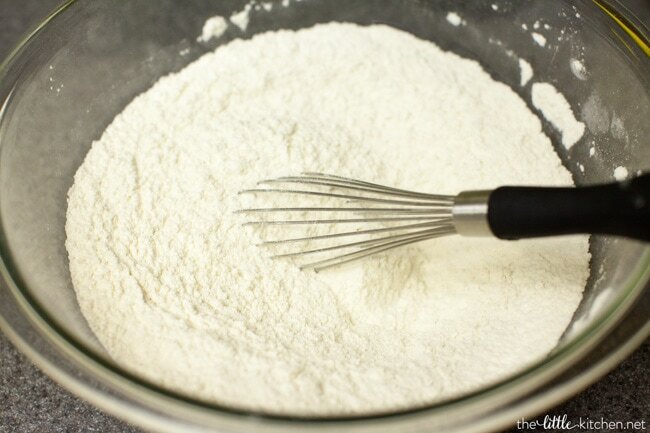 Whisk together flour, baking powder, salt and sugar in a medium-sized mixing bowl. 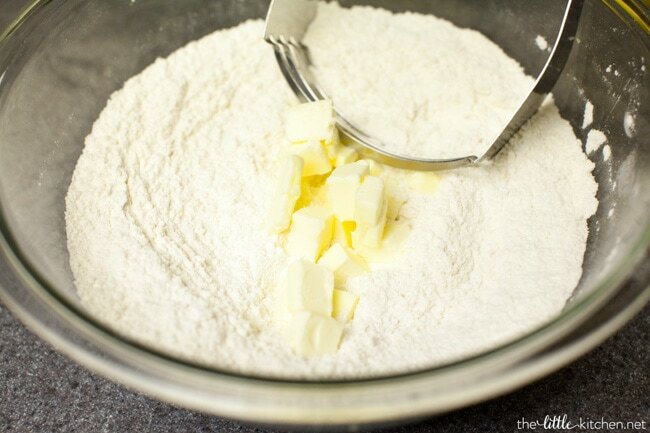 Add cold butter and cut butter into the flour with a fork or pastry cutter. 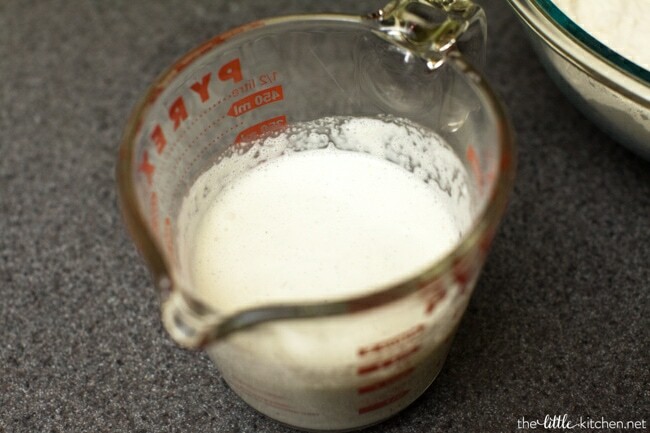 Measure out heavy cream and mix in vanilla extract and lemon juice. 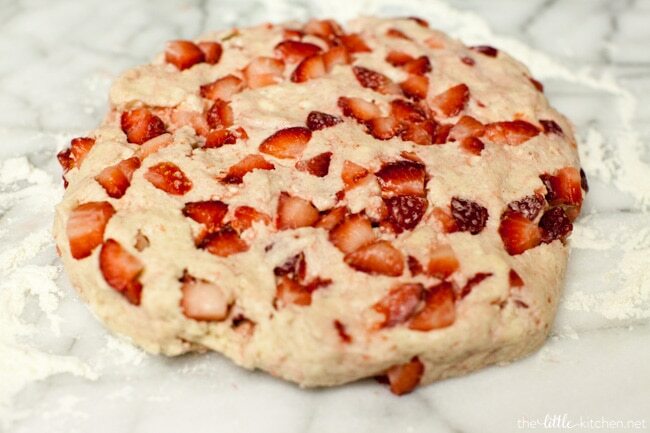 (This way you’ll know all ingredients are evenly distributed throughout the dough.) 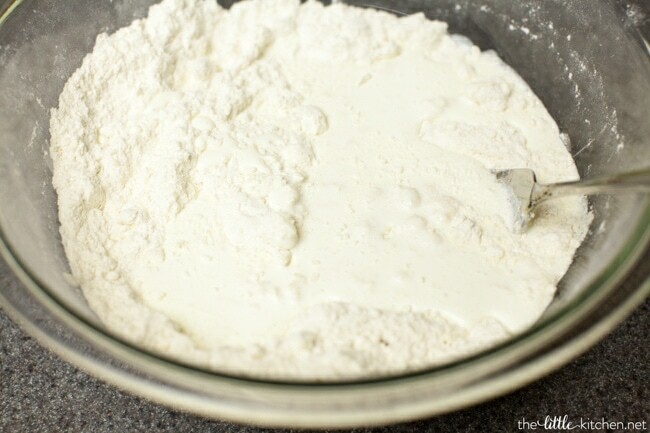 Add the heavy cream mixture and mix with fork. 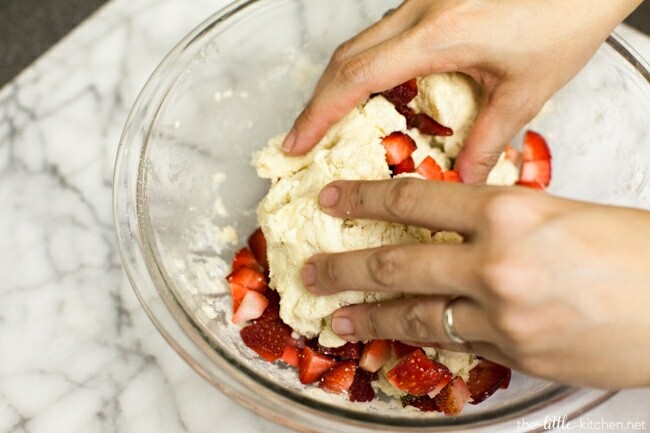 Once dough starts forming, you’ll probably need to start using your hands. 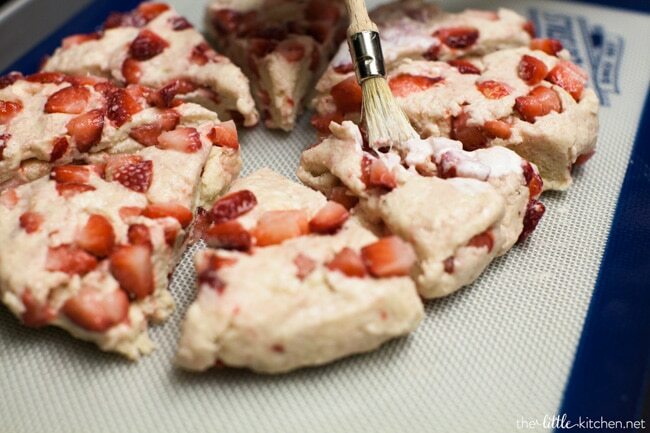 Add frozen strawberries and mix with your hands. 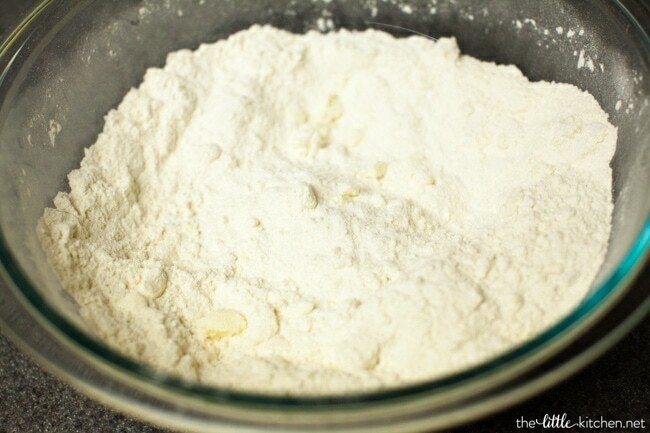 Lightly flour a clean surface, like a marble pastry board and smooth dough into a round shape, making it about 1/2 inch thick. Cut dough in half and then cut each quarter in half into wedges, making 8 pieces. Place wedges about 1/2 inch apart on the prepared baking sheet and brush with heavy cream. 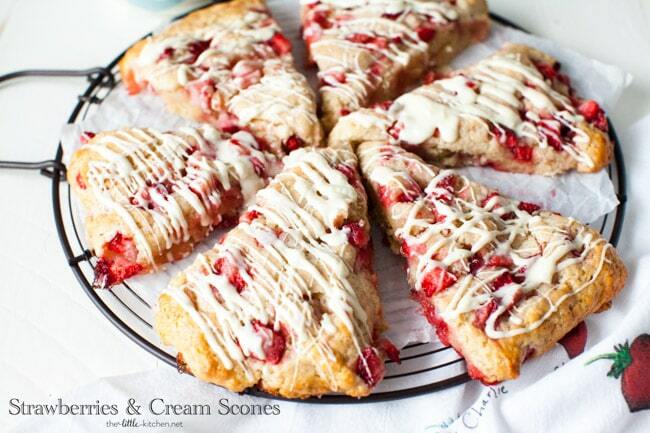 Bake scones for 27 to 28 minutes, until the edges are just about turning golden brown. Allow scones to cool on a cooling rack. 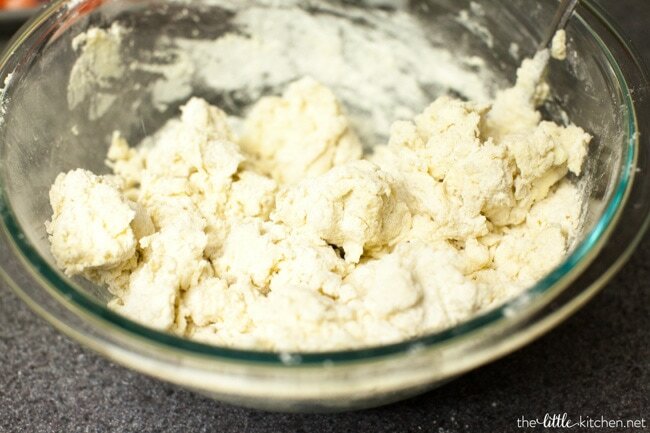 While the scones are baking, melt the white chocolate in a microwave safe bowl on 50% power, for 30 seconds and then 15 second intervals until the chocolate is melted. Add oil if needed to make sure melted chocolate is smooth. Put chocolate into a zippered plastic bag. 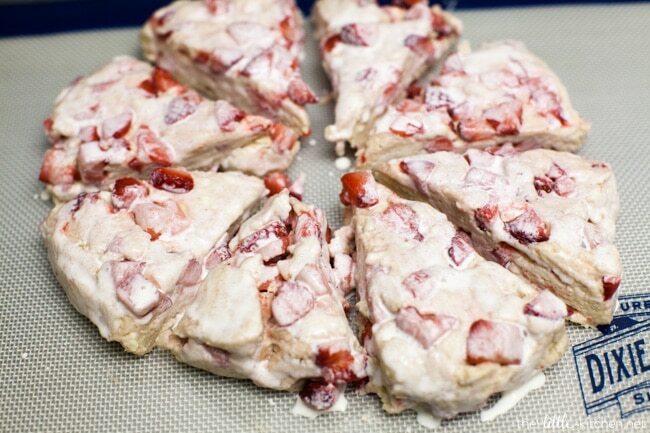 Cut a small hole in one of the corners of the bag with the white chocolate, then drizzle with melted white chocolate. 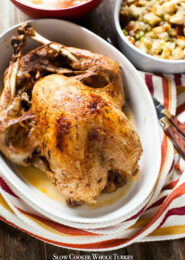 Serve with spreadable butter. 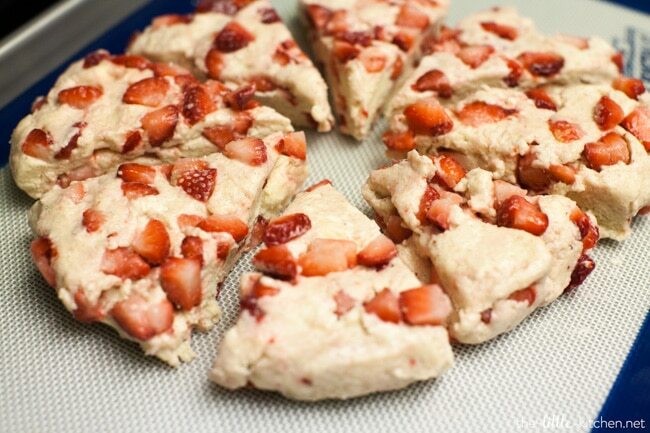 These scones taste great even the next day, so you can make them ahead. Just store them in a zippered plastic bag or a sealed container at room temperature. 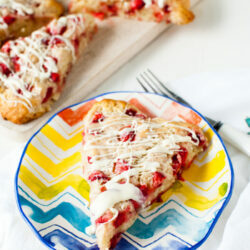 These scones look so, so ridiculously good! I absolutely love the flavour. 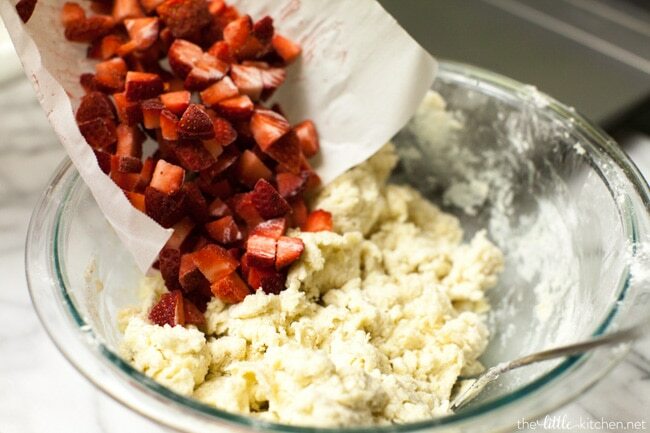 Great tip with freezing the strawberries! They look great! Oh man. 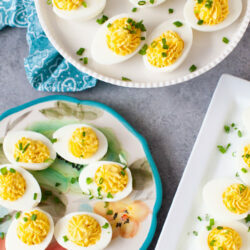 These look absolutely dreamy, and like a taste of spring! I used fresh strawberries (did not freeze) and had a nightmare of a mess. pure goop. Tasted good, but ugly, mugly. What a delicious breakfast! Those strawberries look beautiful! I froze my strawberries over night, but followed the directions otherwise and I have a horrible mess! All 8 slices are now one giant puddle of baked goods. 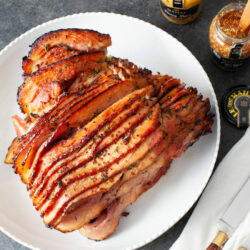 Stil have 7 minutes left, so fingers crossed I can salvage this by cutting out some slices. Hopefully they’ll at lead taste good. Yep, it’s a huge failure. The Taste is ok, but there are still raw pockets and I baked them an extra 10 minutes. That helped but not much. I’m bummed. 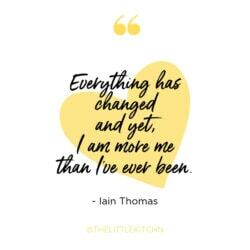 I’m sorry to hear this! I’m not sure what happened…would love to troubleshoot with you via email. 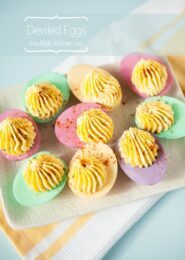 I made these a few times before posting the recipe…so not sure what could have happened! 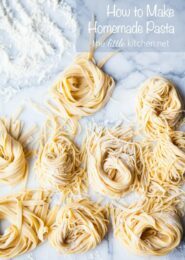 My email is julie @ thelittlekitchen [dot] net. Thanks! 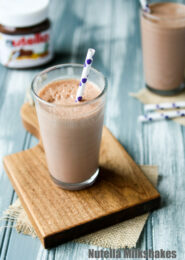 I’ve been craving something sweet, and this will certainly cure my craving.